(Nanowerk News) As production lines become increasingly fast, quality-control procedures must also keep pace. The surface of objects, such as flat panels and glass sheets, can now be monitored for defects—without contact—using an automated technique developed by Xiaoming Yin and co-workers at A*STAR's Singapore Institute of Manufacturing Technology ("Automatic centroid detection and surface measurement with a digital Shack–Hartmann wavefront sensor "). The new system exploits the way a beam of light is reflected from the surface of an object. Similar to waves in the ocean, light travels in a series of wavefronts defined by the light's phase. When a beam of light is reflected by an object, information about the surface shape is carried back by the reflected wavefront. The measurement of wavefronts is therefore a non-contact—and reliable—method for characterizing surfaces. 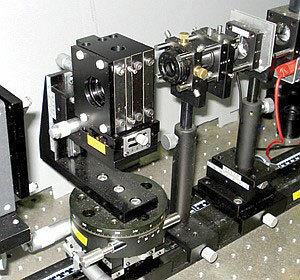 "Other optical systems, such as interferometers, are not suitable for mass-production lines due to their sensitivity to vibrations," explains Yin. Wavefronts are measured using a device called a Shack–Hartmann wavefront sensor (SHWS), which comprises an array of tiny lenses (Fig. 1). Each lens takes a sample of the wavefront and focuses it into a spot on an electronic detector similar to those found in digital cameras. The shape of the wavefront is then reconstructed by comparing the resultant image with one generated using a known surface. The resolution of the system is largely determined by how well the center of the focused spots can be established. A number of different computer algorithms have been tested to accomplish this, but with varying degrees of success. Yin and her team overcome this issue by replacing the array of lenses in the SHWS with a structure known as a spatial light modulator (SLM). Whereas lenses focus light using refraction, SLMs achieve the same result using diffraction but with the advantage of being digitally programmable. A combination of this control over the size, focal length and pitch of the SLM and sophisticated computer algorithms resulted in a measurement system that is flexible enough to be used in a wide range of applications. "Also, conventional SHWSs have the drawback of low lateral resolution. This can be much improved [using] our digital approach," says Yin. The researchers devised a computational algorithm that automatically determines the focus-spot centers, eliminating any error. They tested their system by measuring wavefronts from an aspherical surface: it gave reproducible results and was resilient against any misalignment in the optical setup. In the future, Yin hopes to extend the same concept to infrared wavelengths—it currently operates at visible red wavelengths—so that it can be used for monitoring in the health and aerospace industries.